The WE-717A is a pentode tube that can also be wired as a triode (like in the Yamamoto A08 tube amplifiers). This 1940s military spec 717A was made for Western Electric by Raytheon. 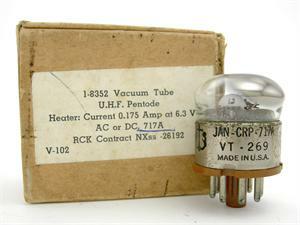 Its metal base has black lettering that reads JAN-CRP-717A VT-269 (base has some oxidation--see photo). Tube tests as new and comes in the original box or a new white box.